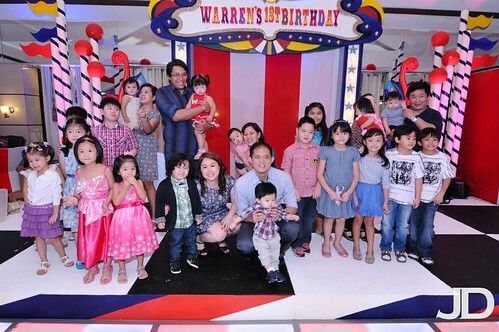 Here are a few more posts of Warren’s AMAZING party! Sorry, I’m a proud mama! Proud that this project turned out better than expected. Proud that everything went as planned. No hitches. No hiccups. Here’s an entrance signage (right picture) I had done by 4th Wall. Love Warren’s smile also in this picture with H. Makes all the planning worthwhile. Our stage had this header on top. Check out the photos below for our full set design courtesy of 4th Wall. We had these as our centerpieces. Each table is depicted with a ‘table month’. I printed out month numbers with a photo of Warren on that month. 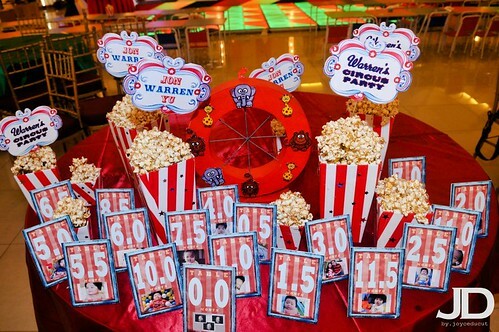 Our table centerpieces were either the faux pop-corn (Yes, they’re fake with glue caramels on top!) or the ferry’s wheel. Each table also had a votive of mini-marshmallow or chocolates. Unfortunately, the guests didn’t seem to be into either so they just ended up being thrown away. 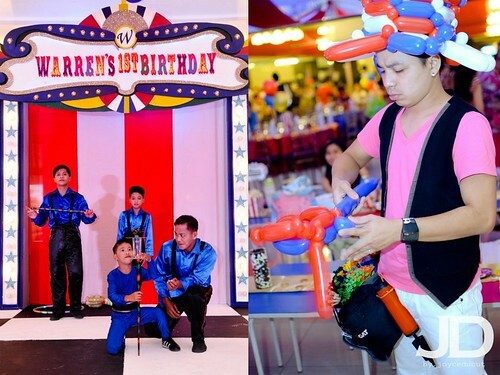 For our program, I commissioned 3 acts (all courtesy of Balloon Republic). Our host / magician / illusionist is Aldino. 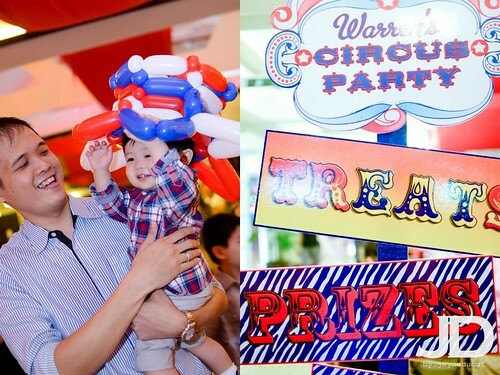 I didn’t get to watch his illusion but the smiles and the stares at the kid’s faces was worth it already. To entertain the guests while we were at the church, he did a few games which a lot of the kids participated in as well. 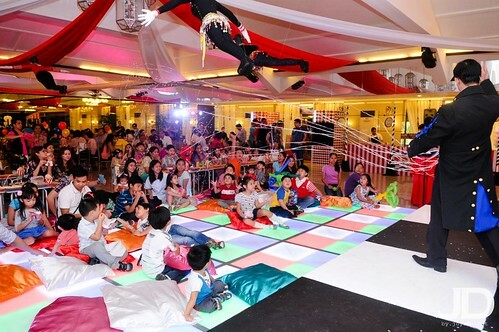 Oh, check out the hanging acrobats on the ceiling! 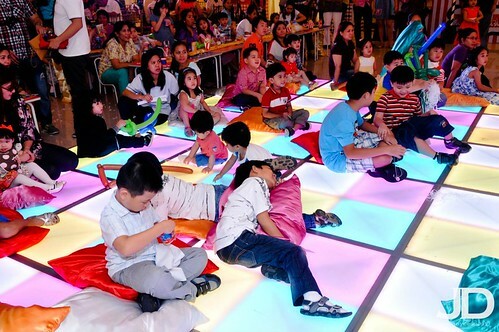 Check out the lighted dance floors which all the kids loved! 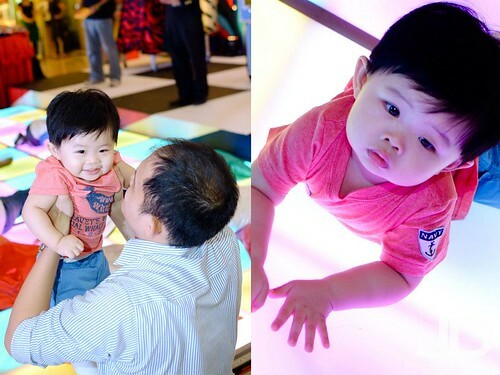 Warren loved it too and was the first one to crawl around it before the other kids caught on. The floors I rented from 4th Wall, as well. 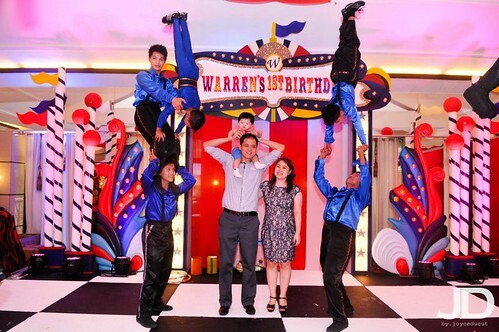 I also got an acrobat troupe! This I got to watch! They were amazing! Apparently, they were one of the finalists in Talentadong Pinoy. We also got a balloon twister. Picture on the right. 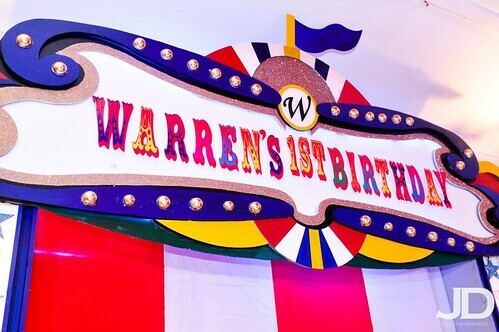 Warren is so into balloons so I could not not have this in his party. Kids and adults got to take home some of his creations. I especially love his fish on hook design. 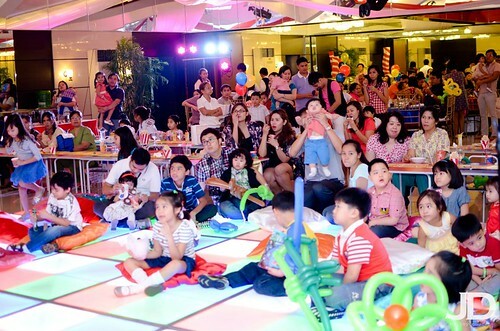 I think what made this a really kid’s party is the fact that we really had lots of kids on the party. We probably had a little over 50 kids in attendance. Here is a picture of half of them. Hello! May I know the name of the acrobat group that you got? Thanks!